Gold prices climbed for a sixth consecutive session today (Monday), punching through the psychologically significant $1,300 an ounce mark. But we see the price of gold in 2016 climbing much higher from here. Before we get to our gold price outlook, here's why the precious metal is trading so much higher today. In morning trading today, gold prices hit a 15-month high of $1,306.00 as the U.S. Dollar Index fell to an eight-month low. A weaker dollar is extremely bullish for gold prices. At last check, gold prices were up $14.70 at $1,305.00 an ounce. That follows a 4% climb for gold prices in April. On Friday, the price of gold posted its highest settlement since January 2015 after the dollar dropped to its lowest level in 11 months. The weak greenback drew investors to dollar-dominated assets like gold. Also boosting gold prices Friday was the Bank of Japan's (BOJ) monetary policy inaction. Many had expected the BOJ to implement additional easing measures in attempts to boost inflation. The BOJ's failure to act sent the yen climbing to an 18-month high against the dollar, rattled global markets, and sent investors piling into safe-haven gold. The Fed remained dovish and didn't commit to a possible interest rate hike in June. Many analysts say that means we can expect just one interest rate increase, if that, in 2016. And the longer interest rates remain low, the higher the price of gold will climb. The slowdown in China has also impacted gold prices. The Asian nation reported GDP growth of 6.7% year over year in Q1 2016, its lowest pace in 25 years. The real rate is likely much lower since the country's government is notorious for keeping actual economic data secret. 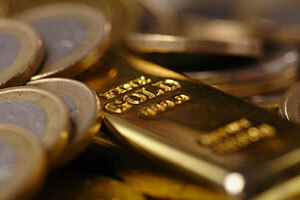 On April 19, China debuted the Shanghai Gold Fix, the country's own gold exchange that prices the metal in yuan. Many believe the exchange could rival the storied London gold price fix, currently settled by the London Bullion Market Association (LBMA). "The big – and crucial – difference is the gold fix on the Shanghai Gold Exchange (SGE) requires purchasers of gold futures to deposit physical gold at the exchange," Krauth explained. "Observers expect this to support SGE pricing, favoring higher levels than in London since contracts are backed by physical metals." The Shanghai Gold Fix will unquestionably boost China's respect in global gold markets. As the largest gold producer and importer, a yuan-priced fix will give China more clout. "With China's significant position in the yellow metal market, gold prices are likely to be very positive as we go forward," Krauth said. Gold prices headed into Q2 2016 coming off their best Q1 in three decades. And the price of gold is poised to continue its bull run. Slowing global economic growth, the increasing use of negative interest rates by central banks, and geopolitical risks will also be bullish factors for gold prices this year. A June "Brexit," the term used to describe the UK's possible exit from the European Union, also has investors on edge. All of these issues have investors pouring money into money alternatives like gold and gold stocks. A handful of gold stocks are handily outperforming the performing the broader market and will continue to benefit from future gains in the gold price. Forbes: Gold Prices Go Viral, Reach Highest Level of the year, but Can't Break $1,300. Is It Similar to S&P 2100?